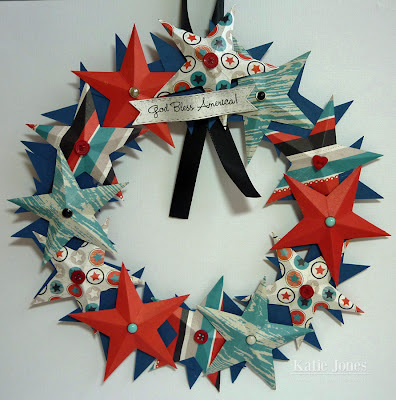 crafting with katie: MCT 3-D Wednesday! Welcome to another 3-D Wednesday with My Creative Time! 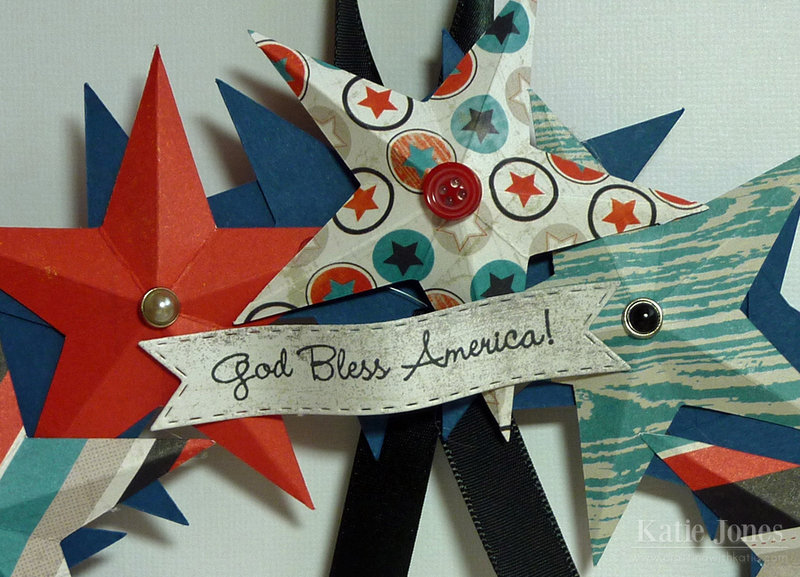 Today we are creating patriotic projects, and I had a blast making this 4th of July wreath! I found a great step-by-step tutorial on the Little Birdie Secrets blog that was very easy to follow. I began by creating a wreath form by taking 6" and 7 1/2" circles in Silhouette Studio and cutting them out of a cereal box. I then covered this with navy 2 1/2" stars. My patterned stars are cut at 3" and I topped each one with either a brad or a hot glued button. 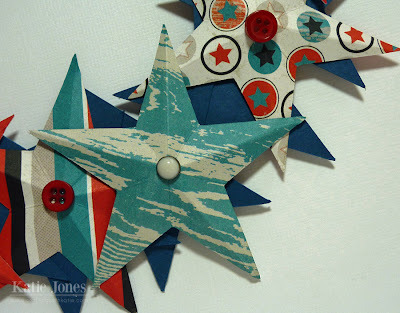 If you visit the Little Birdie Secrets blog, you can see how to make them 3-dimensional. I hot glued some black satin ribbon to the back of the wreath for a hanger. The sentiment is from My Creative Time's My Little Firecracker, stamped onto a banner die made from MCT's Vintage Stitched Label Dies. Be sure to click on the link below to stop by My Creative Time to see what Emma and the rest of the design team have to share with you today. Oh Katie your wreath is amazing I just love each and everything little thing you used to embellish and your paper choices rock!! You always do a fantastic job gosh you are just so talented. lovely wreath, love the different patterns ,and nice touch with the buttons in center !!!! Super wreath. Hope you will stop by and link up at Craftin Desert Divas “Red, White & Blue” Linky Party. Katie ~ Oh my word!!!! This is so GORGEOUS and FABULOUS! I LOVE that you used this paper!!! I will take one of these PLEASE! LOL! I love how this is all out of paper or cereal boxes!! LOVE it!!! !